Bear Brook State Park is New Hampshire's largest developed park at over 10,000 acres, and is home to miles of quiet back roads perfect for biking trips with even the youngest kids. View a map of the route here. Quiet roads are perfect for family biking. with ice and snow at some of the higher elevations, and paddling in cold waters can be treacherous. The sun is shining and temperatures are warming up, but muddy conditions can make getting outside challenging this time of year. 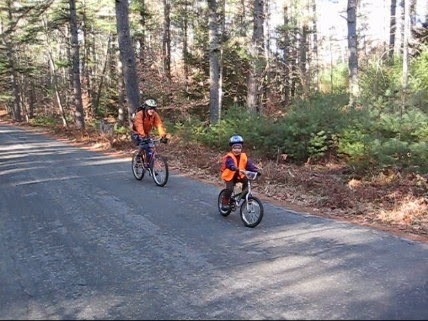 One of our favorite things to do in the spring is to go on family bike rides, and one of the best places to do this is along the quiet and relatively flat roads of Bear Brook State Park, near Concord, NH. When my children Tasha and Jackson were 3 and 5, I was directing the NH Conservation Corps which is a land stewardship program run through NH State Parks, The Student Conservation Association and AmeriCorps. The program happened to be located in the heart of Bear Brook State Park, and for four delightful years my family and I lived in the Civilian Conservation Corps-built Park Manager house near the entrance of the park. While we were there, we taught our kids to ride bikes--and discovered that this park is a biking oasis ripe for exploration by young families. Today, it remains one of our favorite places to ride bikes--and the 10,000 acre park has a wide variety of biking options from the smooth paved campground road to fun downhills on the gravel Podunk Road, to some of New England’s best single track. Click on the map to view in Google Maps. This bike loop on park roads is attractive for many reasons at this time of year. It is 100% on quiet park roads with no challenging trail riding--making it a great loop for even the youngest bikers looking for their first trip “beyond the driveway.” The park roads are not busy until July when the summer campers arrive, making it relatively quiet and safe--a great introduction to road biking with young children. The route is mostly flat, with small rolling hills to make it interesting. 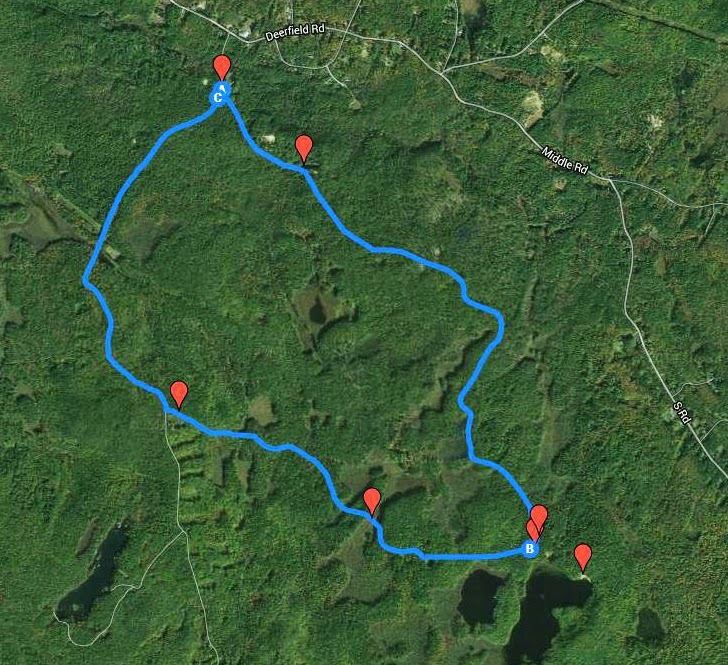 The road winds through the dense pine forests of Bear Brook State Park, passing many interesting attractions along the way: fly fishing ponds, an archery range, a clean sandy beach at Beaver Pond, and even a newly installed playground at the campground. The campground store is not open until late May, so bring your own food and water. Always have your kids stay to the right and ride single file. We always have the person in back (called “sweep”) call out if there is a car coming. That way, folks in front can move over and be as far to the right as possible. Beware of blind turns and hills--car drivers won’t have good sight lines in these areas and you may surprise them. When we are riding on busier roads, we always ride in small groups of 2-3 riders. The reason for this is that when cars do have to pass you from behind, you want to make it as easy as possible. For a car driver, trying to pass a group of 5 bikers on the right with oncoming traffic coming the other direction is very difficult and they may be forced back into the lane the bikers are in by oncoming traffic, thereby forcing bikers off the road. If you ride in small groups, cars can pass you easier, making the experience safer for everyone. For additional details about this trip, visit AMC's Kids Outdoors community. Great Kids, Great Outdoors is an Appalachian Mountain Club blog. This post was written by Ethan Hipple.